Caylee Kalisky and Boris Zipilevich are not your typical millennial couple. They’re driven by the desire to achieve, and already have plenty to show for it. 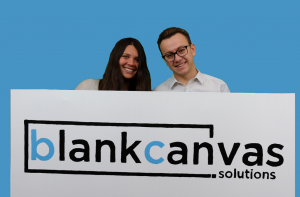 Caylee, along with her boyfriend Boris, started Blank Canvas Solutions, a company that specializes in website development and analytics, marketing, graphic design, 2D animations and voice overs. Part of what sets their company apart is that Caylee and Boris are in a relationship. It is not an easily thing to work with a partner, never mind run a business together. Many people like that Caylee and Boris are a young couple working together. In fact, in their logo, the “C” and the “B” are blue while the rest of the letters are black. The “C” and “B” stand out just like Caylee and Boris do. Boris’ parents also work together and served as an inspiration for the young couple. “I always thought it was so nice”, Caylee explained. The pair knows how to separate work and personal life, and although there have been challenges, they have managed to make it work. During their undergraduate degree, with Caylee studying in the New Media Program at Ryerson and University, and Boris studying Business, Economics and Statistics at the University of Toronto, the pair decided to find a way to combine both of their skillsets. At first, they started out with a few clients and their business remained small enough to work part time. With continuous growth and more and more clients looking for their services, Caylee and Boris risked it all and it has been paying off. Caylee now works full time for their company, with Boris maintaining a part time position for the time being. Caylee and Boris were not strangers to the feelings of pressure to find a job upon graduation like everyone else around them. However, the risk was worth it. Check out Caylee and Boris’ start-up on Facebook and Instagram.